I have driven the 57 miles from Perry County, Alabama to Tuscaloosa many times, with long stretches of bumpy road that is marred by stop lights as you get closer to the city. All in all it’s about a 70-minute drive, a 70-minute drive residents of Perry County have to make if they need to go to the hospital for any critical care, including obstetrics. 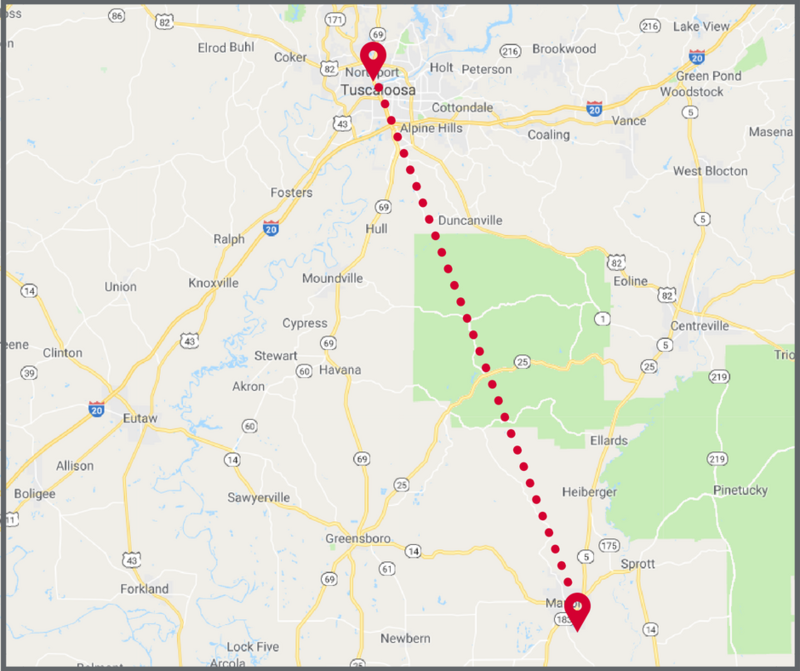 A little bit about Perry County: Perry County is one of 7 Alabama counties that does not have a hospital, with an eighth slated to close in Wilcox County, one of the poorest counties in the state. It’s a grim picture: rural hospitals in the state, especially the so-called “Black Belt” counties (referring to the black topsoil in the region), have been struggling with lack of healthcare access and poor outcomes for decades. The area has some of the shortest life expectancies in the nation, as rural hospitals struggle with too many uninsured and sick patients, but only limited resources available. This issue is turning into a crisis. Closures of rural hospitals cut off what is often the main lifeline of care, particularly for those without insurance. Even more staggering than the hospital closures occurring in rural Alabama counties is the absence of obstetrics care in these areas. Lack of services for pregnant women is an epidemic plaguing rural America in general; 54 percent of rural counties nationwide do not have hospital obstetric care according to the University of Minnesota’s Rural Health Research Center. However, the problem is even more concentrated in Alabama where 70 percent of the state’s 54 rural counties do not offer hospital-based services to pregnant women, and only one hospital in the Black Belt provides obstetric care . All of the Black Belt counties have over 60 percent of births paid for by Medicaid based on data from KIDS COUNT Data Center. This has dual importance. First, Medicaid pays providers at a lower rate than Medicare and private insurance, which means that rural hospitals operating on already slim margins are not able to recoup the needed costs for expensive care, particularly when serving a low volume of patients. The situation would be exacerbated if Medicaid were to be cut. Second, for pregnant women covered under Medicaid, the state provides a list of contacts for beneficiaries to set up their prenatal care. The contact for Perry County, Greater Alabama Health Network, is located in Tuscaloosa; seven other counties are also directed to the Tuscaloosa-based network. In total, Tuscaloosa hospitals provide obstetric care to women from approximately 24 counties living up to 90 miles away. The problem of accessing maternity care does not rest solely on the lack of providers in rural counties; availability of reliable transportation presents yet another road block. Almost 14 percent of households in Perry County have no vehicle. This presents a significant challenge to expectant mothers trying to get to the hospital to deliver a baby or get needed prenatal care. As a result, inducing labor has occurred at increasingly higher rates for women in rural areas in order to ensure they have access to necessary services if any complications arise during childbirth. For a state that already has one of the highest infant mortality rates in the country, the lack of access to hospital-based obstetric care in rural areas is most likely a contributing factor. A task force was created in 2015 by former Governor Robert Bentley to look into ways to improve health and health coverage as well as retain physicians in underserved areas across the state in response to Alabama’s high infant mortality rate, inadequate healthcare coverage and access, and increasing numbers of hospital closures. The group appointed to the task force included the state Medicaid director, policy and public health advocates, providers, and hospital representatives. The final recommendation? The task force determined that closing the coverage gap “at the earliest opportunity” was a first step to making progress in addressing health care inequities in the state. The task force provided compelling examples of the benefit Medicaid expansion could provide particularly for physicians in struggling, underserved areas. Governor Bentley chose not to expand Medicaid in 2014 and current Governor Kay Ivey remains opposed to expansion as well. The Urban Institute estimates Medicaid expansion would increase federal spending in Alabama by 30.7 percent while only increasing state spending by 5.7 percent. For the 34 of 46 of Alabama’s rural hospitals operating in the red, increased funding could mean the difference between serving communities and a closed sign on the front door. It’s not a cure-all, especially for the absence of hospital-based maternity care, but it would be a start. While writing this blog, I thought a lot about the 70-minute drive from Perry County to Tuscaloosa. I thought a lot about the obstacles women in Alabama must overcome to get the health care they deserve, everything from the lack of providers and hospitals accessible to them to the pure logistical challenges of not having transportation. One thing is clear: something needs to be done. The people of Perry County, of the Black Belt, and of Alabama deserve better. As an Alabamian, I want more for my state.